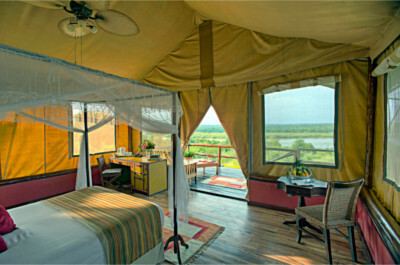 Each of the 54 rooms at Paraa Safari Lodge are complete with balcony and en-suite private bathroom. In 1864, when the famous British explorer Samuel Baker first glimpsed the power of the Murchison Falls, his accommodation was rudimentary at best. He would have been as stunned by Paraa Safari Lodge today! The choice of accommodation at the lodge varies – a cottage, suites, double, twin and single.